It’s that time of year… summer squash is plentiful and you’re looking at a pile of it right now, trying to figure out what to do with all those little yellow cuties. We recently ended up with a bunch of summer squash from our friend Alicia, who only has one squash plant in her yard. And yet, she had more squash than she could handle! 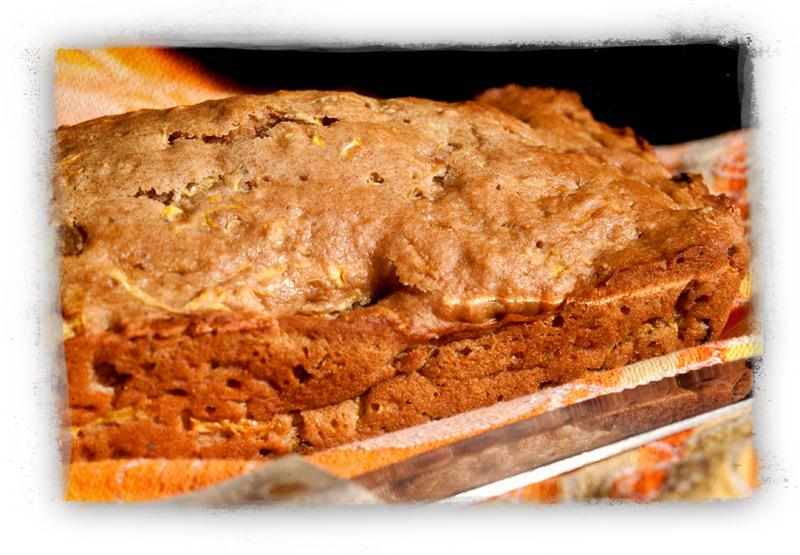 We took some home and came up with Sweet Summer Squash Bread. You can say it’s sweet because summer is sweet or because the bread is sweetened. Or both! Basically, we remade a zucchini bread recipe to be more, well, blonde. Just like our friend Alicia, who is also blonde! Enjoy the bread and hope you find lots of fun ways to use up your summer squash – you know, besides all those endless stir-fries! Preheat oven to 350. Spray a loaf pan with non-stick spray and sit aside. In a large bowl, combine applesauce, sugar, non-dairy milk, lemon zest and vanilla. Sift in all purpose flour, whole wheat flour, baking powder, baking soda, cinnamon and salt. Fold in grated summer squash and golden raisins. Pour batter into prepared loaf pan and bake 45 to 50 minutes, until a toothpick inserted in the middle comes out clean. Cook’s Notes: Want to try this another way? Add a pinch of ginger or nutmeg instead. Or instead of golden raisins, go with chopped almonds, dried cranberries or walnuts. Some summer squash has tougher skin; you may want to peel it if that’s the case. The same goes for larger summer squash with big seeds. If your squash is seedy, so to speak, scrape the seeds before grating.